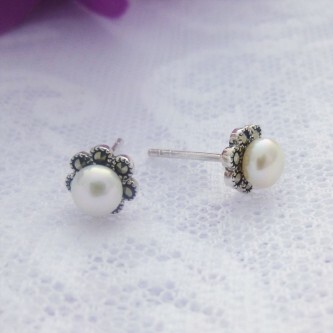 A very dainty and elegant pair of Marcasite and pearl earrings that you will treasure forever! 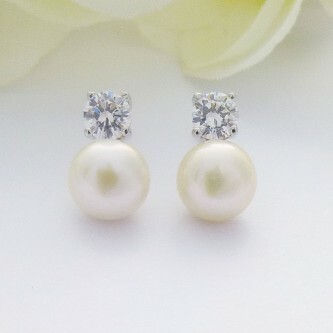 Stylish, elegant and simply beautiful, classic freshwater pearls with a cubic zirconia stud. Very beautiful, an ivory freshwater pearl with delicate cz stones in a swirl of sterling silver. 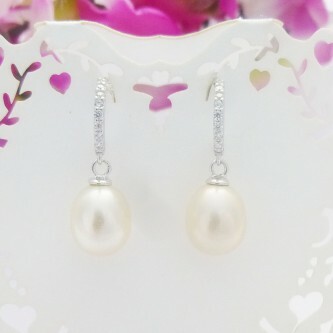 Pretty, cz half hoop and pearl drop earrings, the perfect accessory for bridal wear or a glamorous evening out, beautiful! 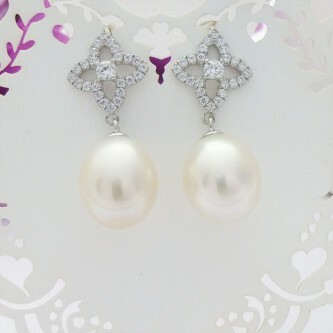 Gorgeous earrings, perfect for a big night with a CZ over the pearl in a drop earring, elegant and sparkly. 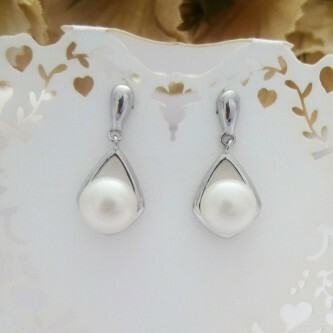 Teardrop earrings in sterling silver with a freshwater pearl, elegant and the classic teardrop bridal earrings. The new Guilty collection of sterling silver stud earrings, hoop earrings and drop earrings. A classic range full of elegance and style with classic freshwater pearl drops, encrusted stone stud earrings, hearts and hoops. The classic ladies silver earrings include small and large earrings, elegant design and modern studs. Get free delivery on all of our earrings, they also come with bespoke branded earring boxes designed for studs, hoops and drop earrings. View the new range of earrings available from Guilty with free delivery in the UK and the Republic of Ireland. Our new range of ladies earrings includes a wide variety of style and have been chosen to enhance our offering of high quality jewellery that is classical in design and made to high quality standards. Our ladies earrings collection covers a wide range of styles from the classic silver drop earrings that are perfect for weddings for brides and bridesmaids to studs, the most popular style for day to day wear for all women. The earrings are all made in 925 sterling silver with many being plated in a range of metals such as gold or rhodium. All of our products are sourced from UK suppliers and silversmiths and all are assayed at in the UK providing you with peace of mind that our earrings are genuine 925 sterling silver. The Guilty earrings collection covers a wide range of styles. 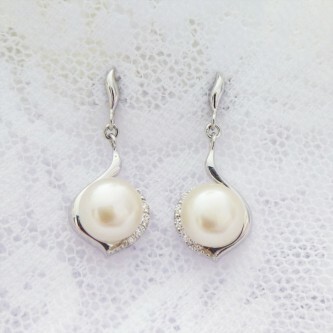 One of the most popular sets of earrings are the classic pearl drops, these are the most popular style for weddings and formal dinners and parties where the elegance of your earrings is essential to compliment that stunning dress or outfit. The range also has more daring styles such as our silver skull stud earrings, ideal if you want a set that really stands out. There is a large selection of sterling silver stud earrings in a range of stones including blue topaz, amethyst and cubic zirconia, marcasite and citrine. Many of the studs are clear cz in a range of different styles that are perfect for every day wear with simple designs such as round or square stud earrings. The range also has alternative shapes including bow and the classic teardrop studs as well as pretty bows and elegant flowers. Guilty also have a range of silver earrings with hoops with intricate and elegant features that make them different to standard hoops and the back fasteners include stud, butterfly backs and loops so that there is a choice for everyone. All of the Guilty Earrings come with free delivery through Royal Mail, they are all packaged in bespoke Guilty branded boxes that are specifically designed for earrings with different styles of boxes for stud and drop earrings. We are also more than happy to help you to choose the perfect style so if you need some help with making your choice or are undecided, call us on 01271 814966 and we can certainly offer you our advice and opinions on what would be the best set of earrings for you if they are a girft for a wife, partner or girlfriend.